Which Dance Style is Right for Your Child? If you are planning to sign up your child for dance classes in Tucson, you will first have to decide which dance class is the best for them. There is a wide range of dance class options for your child as their mood varies over time. So it could really be a challenge to choose the dance style fit for your child. 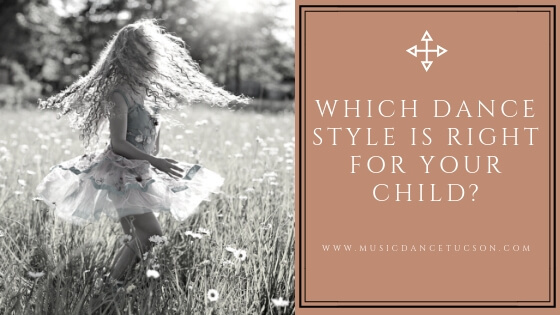 In this blog, we have put together a guide to the different dance styles to help you choose the right one for your child. By studying ballet, your child will develop the fundamentals of dance through grace, alignment, flexibility and strength. Ballet originated during the Italian Renaissance in the fifteenth century. Over time, it has defined the foundational techniques used in many other dance genres and cultures. There are stylistic variations and subgenres that developed through time. There is Classical Ballet which is based on ballet technique and vocabulary. There are also different styles of classical ballet such as French, Italian, English and Russian ballet. Romantic ballet emerged from pointe work where there is a dominance of female dancers wearing longer tutus. Does your child have happy feet? Tap dance which uses the sound of tap shoes striking the floor as a form of percussion is developed from Irish and African American dance forms. Your kid will get to develop motor skills, rhythm and coordination while having fun. Jazz is a dance that showcases individual skill while emphasizing improvisation. It combines many dance styles and techniques including ethnic dance, social dance and ballet. Jazz lessons teach kids basic moves but this style encourages kids to explore moves on their own and find their own way of expressing themselves through dancing. Most students learn ballet to learn the basic skills before signing up for jazz classes. At Music & Dance Academy Tucson, our dance program offers classes beginning at age 2 and some of our students are in their 70’s and 80’s. The Academy emphasizes quality, the development of dance technique, confidence, and self-esteem through innovative teaching methods that make learning different dance styles enjoyable and rewarding for students of all ages and levels. Click here to find out more. Follow this link and take the next step with us.